Bleadon Market is a friendly mixed event with a Somerset village atmosphere selling local produce: meat, cheese, fruit and 'in season' vegetables, plants, flowers, preserves, breads, cakes, etc. Also crafts, books, jewelery, antiques, collectables, bric-a-brac, pet products and much more. 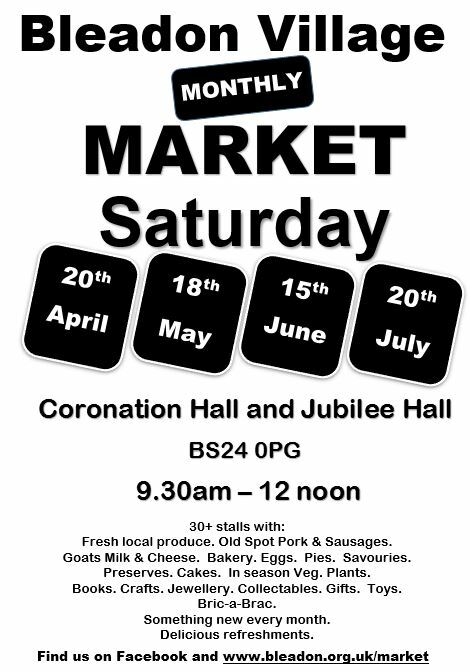 There is something new every month, please see the monthly stallholder listings below for more details and there is also a Community Cafe, selling hot and cold drinks and snacks. Hot drinks, teacakes, bacon baps, sausage in a roll, toasted sandwiches, snacks, etc. Paintings and prints, watercolour, oils etc. commissions undertaken. Fairly traded goods from small producers around the world Show you Care! With Sian Vowles Consultant Great Offers! selling Antique/vintage jewellery, bric-a-brac, crafts, etc. in the Coronation Hall and Jubilee Room, Bleadon, BS24 0PG, from 9.00am - 12.30pm. and held in the three halls on the village green.